As part of the Sigma Affiliate Programme I was sent the Cleansing & Polishing Tool (Link!) which i have been using for the past few weeks. As soon as i saw it released i thought that it looked quite similar to the Clarisonic which i have wanted to try for a while but at a much cheaper price! The Sigma Cleansing & Polishing Tool comes with the tool itself and also three different brush heads in soft (pink), medium (pink/white) and firm (white). 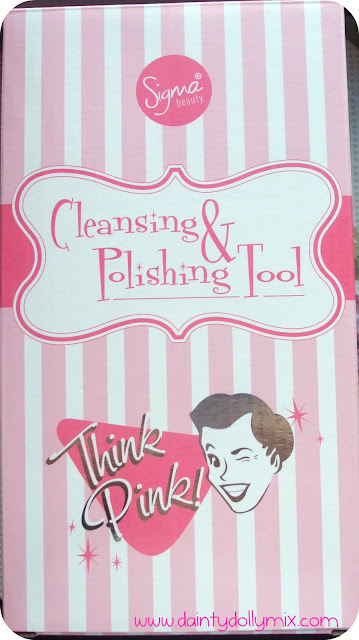 It comes in a cute pink and white striped box, and the tool itself along with the brush heads are housed in a pink, frosted plastic case. I personally use the soft brush head for cleansing and polishing my face as my skin can be quite sensitive and when using this daily i want to be as gentle as i can. I remove my makeup with a face wipe previous to using the actual tool itself and then I apply some of my Liz Earle Cleanse & Polish to the brush head when its on the tool. I do this because i dont want to Cleansing & Polishing tool to act as a makeup remover but more as a skin exfolitator. On a morning, i use this with my Liz Earle cleanse & polish again but without the need to use a face wipe first and then tone and moisturise as usual. Sigma suggest that you use the medium and firm brush heads for body exfoliation although i am sure you can use these on your face too if you dont use it as often. The price itself is the winning factor to me, this retails at $39 which in UK terms is just under £25. Amazing value! The Clarisonic retails for well in excess of £100! So it is at least a quarter of the price! With constant use, morning and night this has well and truly transformed my skin. My skin went through a patch where it was absolutely terrible to the point i was contemplating panoxyl which i believe is for acne. Cleansing & Polishing with this tool, which is extremely simple and with the Liz Earle product on top is the winning combination for my skin! It is now pretty much completely clear. It is so simple to use and literally takes a minute of your day. It leaves my skin extremely cleansed and polished. Overall, i love the Sigma Cleansing & Polishing Tool. The price is amazing and the quality of the product exceeds the price. It is quite heavy and doesnt seem like a cheap product at all. It is so easy and quick to use and the brush heads can be changed with ease. I also love the carry case of this tool! So you can keep everything nice and neat and altogether! If you order anything through Sigma here then you will receive a free gift if you spend $30! I have a giveaway of the Sigma Cleansing & Polishing Tool coming up in the next couple of days so please look out for that! This looks great, I've been looking at the Clarisonic but I just can't afford it! I'll definitely keep an eye out for your giveaway! I'll definitely be looking out for the giveaway. So want to try this as been lusting after the Clarisonic for a while! I can't wait to try this out! I'm almost there for the affiliate program. =D Thanks for the review. wow nearly a dupe for clarasonic! would be interesting to try it out! I've been debating picking up a Clarisonic for ages now, but I think I might give this a whirl instead! Ty for the post!